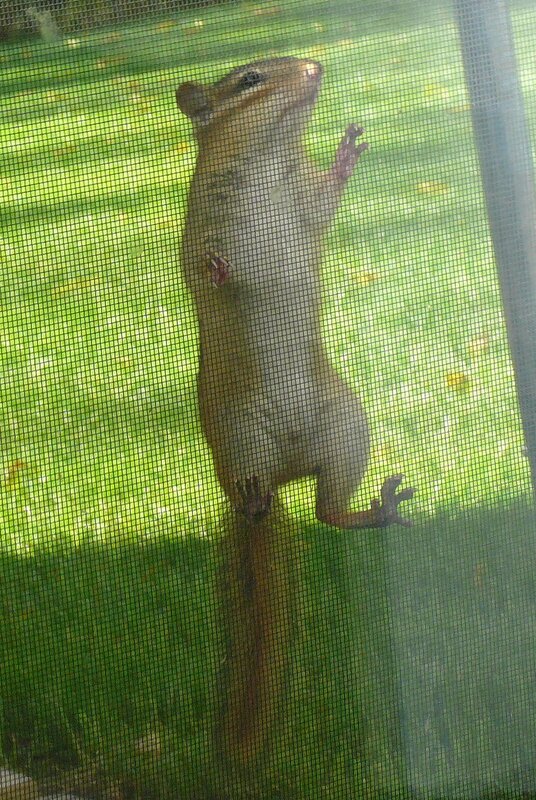 I’m going to let you in on a little secret, Chipmunks. The proof is in this post, a.k.a., The Worst Post Ever. Last night, I got a magical email from someone regarding evidence that a Mini Me exists in this otherwise colorless, desolate, mustache-deprived world. For the first time since I saw this, I felt complete. I don’t know how it happened, except I think I do, and it involves vodka-soaked cherries. But then there is the more fun. 2) Warn you. Everything they say about blondes is true, especially Clairol-enhanced blondes like me. Expect posts about purses that double as dog carriers and/or alien abductions any day now. Don’t be a cotton-headed ninnymuggins like me and forget to enter the latest mustache glasses giveaway (deadline: Thursday, July 19, 2012, 12pm EST)! P.S. – You guys are seriously like adorable, little, chubby-cheeked miracles. My comments and inbox are alight with your splendor. So much so that I think I must launch a weekly feature for the rest of the summer to prove it. Stay tuned. Heck, it can only go up from here. Previous postJuly ‘Stache Glasses Giveaway! Next postWhat in the Who in the How is Going On? 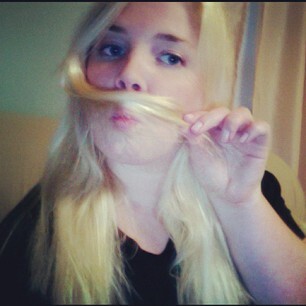 I, personally, prefer to match moustaches from my strands when they are in a pony tail – I feel like the end result is more subtle and life like. I think. Nancy, I’m so glad you brought this up. You are so right. I feel like I’ve learned a lot since I took that picture last summer, and I’m not sure I would ever attempt a pony-less mustache again. you are a funny chipmunk, errrr…girl……..chipgirl? DOGS in PURSES?? Oh, man, that’s wild! Would you rather: Carry a dog in a purse or buy “50 Shades of Grey” in person? I still haven’t heard from her either, Susie! It is amazing the feelings of loss I have in my ninnymuggins heart. Mini me, where are you?! I’m adding ninnymuggins to my list of words I like, such as doink (a unit of measurement) and smaktalk (brings to mind strong, yet suitably sarcastic). You use “doink” as a unit of measurement? It’s perfect! Sadly I can’t take credit for “cotton-headed ninnymuggins” – it’s from “Elf” with Will Ferrell (one of the best holiday movies EVER)! A Mini You, I have to see this! I hope you rediscover your lost proof and share this delightful creature with us. P.S. Vodka soaked cherries? Yes please! Oh, Rian, she was perfect. But I haven’t heard from her mom again – GAH! It’s like a little part of me I didn’t know existed three days ago has died. nannygoat…nimrod…ah, here we are…ninnymuggins…hey, how did your picture get in here????? I would pay good money for that. Or at least a few dozen acorns. First off, this is hardly The Worst Post Ever. Secondly, I hope you find that picture. A mini-Jules would be absolutely priceless (especially if she rocks a faux-stache)! Third, vodka-soaked cherries? Sign me up! theres a kid out there somewhere wearing a mustached monacle and swigging champagne? good god, call the chipmunk squad. thank god for le pep!!! I feel like it was too amazing to be true and I really did make the whole thing up. Haha! You’re blogger of the week on Byronic man. Stopped in to say hello. Much deserved! Thanks so much, Nifti! 🙂 B-man rules the school; I really think mustaches are the ONLY way his blog could possibly be improved upon. Jeez Jules, even when you’re not making any sense you’re a scream. It’s a gift, is what it is. yeah! Ditto to what Pegorella said! LOL You two really shouldn’t encourage me when I’m in this state, you know. Then again, it’s nice to know someone will be holding my drool cup when I’m convinced I actually AM a chipmunk. Oh! Well now that you put it THAT way….I totally don’t get it. Are you really, Darla?! Even if not, just the thought makes me feel like a proud Momma chipmunk. Yessiree Bob! I just downed a lovely glass of red wine. Why? My older brother is here with his wife. And two kids. And 2 dogs, 2 cats and 3 rats. Yes, rats. I think having rats in your house qualifies for having a little wine, does it not? Get out! seriously?? I can’t wait to see it! I just realized you were probably kidding, right? In my alcohol-induced haze I can’t detect sarcasm. Would I joke about this? Check your email. I’m not sure what you’re talking about here, but I love everything you write anyway. That makes this post like a DOUBLE Doh!, which I think we can all agree is like a double rainbow and everything is going to work out. Oh! And, to explain: Basically someone I don’t know emailed me, said they found my blog and their daughter was my Mini Me; she included a picture. I accidentally deleted the email in my attempt to clean up my inbox (er, and then there was the vodka. Yes. That may have had something to do with it) and I have no way of getting in touch with her other than through this blog plea! In the period of time where i did not know about your blog that i like to call the dark (as in brunette) ages, i heard that song by darren criss (I didn’t of course know at the time that he was your second husband). It was like a thousand double rainbows filled my heart and it was if by looking at the video of him playing piano i all of a sudden had all of lifes questions answered for me. And then i replayed it about 10 times while andré shook his head and put his headphones on. He was obviously overwhelmed by how amazing the performance was and putting on headphones so that he could find the video and listen to it closer with his headphones on. Anywho, i can’t wait to see your mini me! I still haven’t heard from the mom of Mini Me! I feel so lost in this mini me-less world. Noooo! Maybe if you subscribe to Byronic Man’s blog twice you’ll get my posts?? Aw man, I wish I knew what was wrong with it! And me too! But who does he think he is rocking the ‘stache glasses better than me? No fair. No worries, you’re still the queen of the ‘stache glasses! What just happened, Jules? I’m totally lost and way more clueless than you can possibly claim to be. I hope all is well and I don’t need to send in the Chipmunk reserve squad to help you through this crisis.